When creating a new project, after defining the Processing Options Template, the Select Output Coordinate System window is displayed. The output coordinate system does not need to be the same as the images' coordinate system or as the GCPs' coordinate system. It is recommended, though, that the output coordinate system is the same as the GCPs' coordinate system. For GCPs: All GCPs must have the same coordinate system. For the images: WGS84 (egm96). 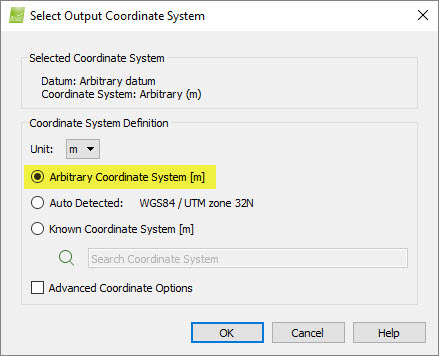 For the GCPs: The coordinate system that is selected when creating a new project under the Output / GCP Coordinate System section: Step 2. Creating a Project. Arbitrary: If the project has neither image geolocation nor GCPs. The corresponding UTM zone: If the project has image geolocation. The coordinate system that is selected for the GCPs: If the project has GCPs. For local / arbitrary coordinate system. For global, continental or national coordinate system defined from list. For global, continental or national coordinate system defined from EPSG. For global, continental or national coordinate system defined from .prj. For auto detected coordinate system (only for the Output Coordinate System). 2. In the Select Image / GCP / Output Coordinate System window, on Coordinate System Definition section, click the Unit dropdown list to set the units of the coordinate system (meter [m] or international foot [ft]). 3. Select Arbitrary Coordinate System [unit]. 1. Click Site Calibration... For more information about the Site Calibration: Select Image / GCP / Output Coordinate System . 2. Set the site calibration parameters. The coordinate system now has been chosen. 2. In the Select Image / GCP /Output Coordinate System window, on Coordinate System Definition section, click the Unit dropdown list to set the units of the coordinate system (meter [m] or international foot [ft]). 3.In the Select Image / GCP /Output Coordinate System window, on the Coordinate System Definition section, select Known Coordinate System [unit]. 4. 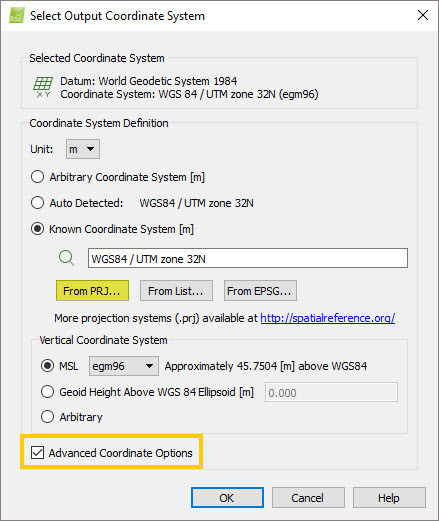 (optional) In the search text box, type the desired coordinate system: The search text box allows to find the coordinate system in auto-complete mode from the Pix4Dmapper's database (a coordinate systems' list and EPSG codes). 5. 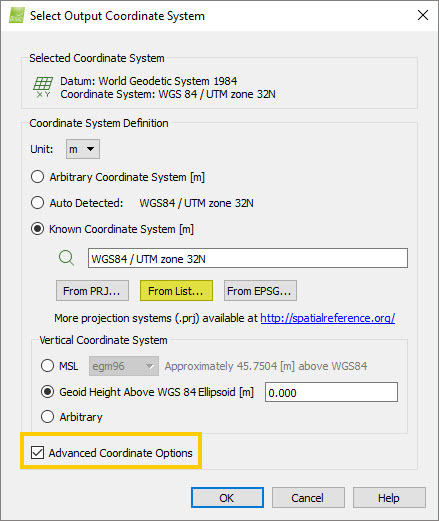 Select the Advanced Coordinate Options check box. 8. On Datum, click on the drop-down list and select the datum. 9. On Coordinate System, click on the drop-down list and select the coordinate system. 11. On the Select Image / GCP /Output Coordinate System window, click OK.
7. In the Coordinate System pop-up window, under Choose EPSG Number, click on the drop-down list and select the desired EPSG code. 9. In the Select Image / GCP /Output Coordinate System window, click OK.
2. On the Select Image / GCP /Output Coordinate System window, on Coordinate System Definition section, click the Unit dropdown list to set the units of the coordinate system (meter [m] or international foot [ft]). 3.On the Select Image / GCP /Output Coordinate System window, on the Coordinate System Definition section, select Known Coordinate System [unit]. 7. On the Import .prj File pop-up window, navigate to the .prj file. Note: For information about how to obtain or create a .prj coordinate system syntax file: How to obtain or create a .prj coordinate system syntax file. 8. Select the .prj file. 10. On the Select Image / GCP /Output Coordinate System window, click OK. Important: If the project does not have image geolocation, this option is not available. 2. 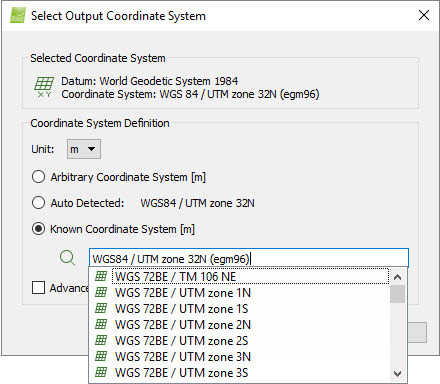 In the Select Output Coordinate System window, on Coordinate System Definition section, click the Unit dropdown list to set the units of the coordinate system (meter [m] or international foot [ft]). 3. 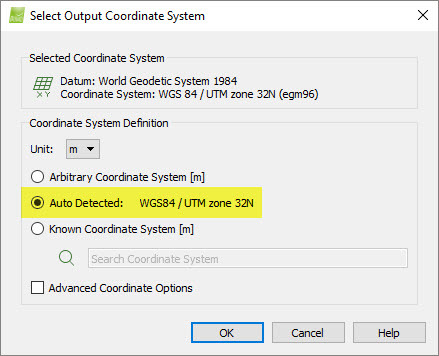 In the Select Output Coordinate System window, on the Coordinate System Definition section, select Auto Detected. Based on the coordinates of the images and the selected unit, Pix4Dmapper will auto detect a coordinate system. 4. On the Select Output Coordinate System window, click OK.